In our parish is the fortified church of Killesk but is usually called a castle. It was built for defensive purposes like the fortified church in Clonmines. 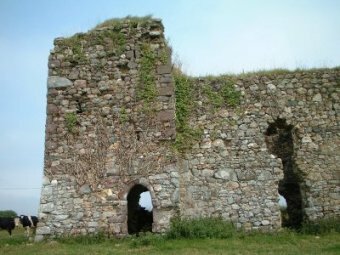 It is thought to have been built by Hervey de Monte Marisco,the founder of Dunbrody Abbey, or his nephew,Geoffrey.It could be used by the monks as a place of sanctuary before the tower at Dunbrody was built. It has been called "a church of ease" belonging to Dunbrody. This means it was not the main church but could be used by people living far from the abbey. The site for the church was well chosen as it has a stream flowing near by and was a wooded area. Killesk or Cill Uisce in Irish means "the church near the water." There is also an excellent view here in all directions. The church is surrounded by a low earthen bank, about 1 metre high,and this too was for defending the church. The church is made up of two parts- the defensive tower and the church. The church is joined to the tower on the eastern side. The door in the tower is small, measuring 1.67m in height and is 76cm wide or 5.5ft by 2.5ft. The doorway was protected by a murder hole where missiles or hot liquid could be dropped down on any unwelcome visitor. There is an interesting defensive feature on the two sides of the door or the door jambs. On the west side is a long deep opening or groove and there are two more on the east jamb. It is likely that a wooden beam went across these openings for safety. it is spelt to-day. The Fitzgeralds were then called Barrons. William Fitzgerald or Barron was succeeded by his son Roland in 1568. His son Richard later took over. After Cromwell's invasion the Barrons lost out. In 1655 the lands of Killesk,Drillistown and Knockea were divided among Nicholas Loftus, Earl of Anglesey and others.In all over 600 acres were divided up. Later the Glascotts owned land in Killesk and Knockea.George and William Glascott were rectors of Killesk. tower measures 8m from N to S and 5m from E to W. This is 26ft by 16ft. Inside it is cylinrical shaped or barrel-vaulted. The church measures 6.9m from N to S and 7.9 from E to W. or 25.5ft by 22.6ft. Inside,the church is about 34 feet in length. The castle had 2 storeys but the second one is destroyed. of the walls have collapsed. The church windows in North,South and East walls are destroyed. However it's still a fine ruins and is nearly free of ivy which can damage the building. After entering the well fortified door in the tower you are inside the church. The stairs is to the left and has 2 high steps at first and then becomes a spiral stairs. This stairs was for defensive purposes. There is a light or window off the stairs on the west wall. It is safe to climb the stairs which leads to the gallery of the church or the loft through a pointed doorway. After this the stairs continues to spiral upwards to the first floor. Off the stairs is a small room like a dungeon or oubliette. It is built into the wall and is known as a "priest's hole". It was probably a hideaway for the priest to meditate or to hide from intruders. The stairs divides in 2 directions. To the left is a doorway which probably led to the wall walk of the church and the right takes you to the second storey. Here you will notice the opening of the garderobe chute. 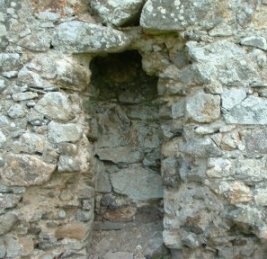 This was the latrine or toilet which ran down the side of the wall and opened at the bottom of the west wall on the outside. 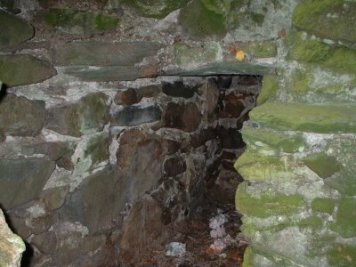 There is no evidence of a fireplace or chimney in the castle. There is no trace of a font either. 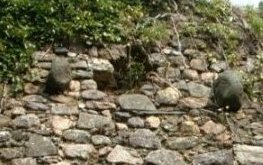 However there is a recess or opening in the south wall towards the east. This is where the altar would have been and the name for this recess is an aumbry which was a cupboard for storing sacred vessels. It is about 18 inches square. There are 2 corbels on the North and South walls. These are projecting stones used to support the roof. Also, there are 2 beam slots on the East wall where large planks of wood fitted. Finally a look at 2 windows which stand out in the church.The east window which is now ruined is supposed to have had a beautiful stained glass painting of the Last Supper.